it carries vital nutrients throughout your plants' system. systems, and repairing faulty irrigation. systems that minimize the waste of this valuable resource. adding a new zone can make a dramatic difference in the efficiency of your system. basins or piping off your gutter down-spouts. 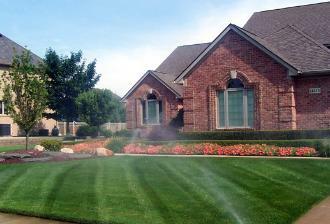 ornamental plantings that can be added to any existing irrigation system. Gets your system ready for summer. We will turn on the system and check all lines, heads, and nozzles for proper function. inspect the system for any damage and make adjustments as needed for proper coverage. drought. We will also inspect for any needed repairs to the system. water using compressed air. Finally, we will open all manual drains and faucets. Any questions or concerns? Call us or contact us, and we’ll handle it immediately and with the utmost care.